Current Itinerary: We’ll probably be here or in Caye Caulker for the next week or so as we want to get our scuba diving certification here and do some dives. After that we’ll spend another week to 10 days bouncing around Belize before heading into Guatemala. Note #1: I know, I know...it’s been a week and a half since you’ve heard from me. We ended up detouring to Cozumel to meet up with my buddy Karl. We have really been busy and I haven’t had as much time to write or use internet as I would have liked. It is a TON of work to keep these journals and website going so please bear with me. As the pictures get posted during this week, you’ll see that it was worth the wait. Just to appease the masses...anyone who liked the last journal will get a nice little chuckle from this picture. Note #2: YES! We finally made it to our second country! We loved Mexico and we are already learning how tough it is to keep on the move when there is so much to explore. Note #3: A relatively short journal today...another will come over the weekend depending on what happens with doing a diving course. We actually had to set our alarm to get up at 6:15 to catch the early bus back to Tizimin. Dang it, I thought I had escaped the world of alarm clocks. We met up with Mark and Jo (our new traveling companions from England) and got on the bus at 7:00. As we got on the bus we were talking about how cool it was that we had seemingly randomly met up and now were off together to somewhere new when I tried to remind everybody that it was actually the sunscreen that brought is together...well, I look up in the compartment above the seats and wouldn’t you know it, there was the very same sunscreen that had fallen out of Jodi’s bag 2 days before! That is amazing...especially if you consider that these buses run every hour or so, which means there are probably 2 or 3 different buses that travel this route back and forth a few times a day. The odds we would get on the EXACT same bus were not that great, and fact that no one had thrown out the sunscreen since Tuesday afternoon is even crazier! We got to Tizimin a little over an hour later and found that the next bus to Chiquila (where we would get the ferry to Holbox) did not leave until 1:00 p.m. Well, since it was about 8:30, that did not seem like a great option, so I asked the guy if we could just get a bus in that general direction. I figured if we could get to a main “town” not to far away from there that we’d be able to get a collectivo fairly easily (this is where experience helps you as a traveler...most people would have been stuck in that bus station for 5 hours). An hour later we boarded a bus to Kantunilkin and we were on the move once again. We ended up having to get a taxi from there to Chiquila but with four of us it was only 25 pesos each. It worked out really well though because taking the taxi was faster than a bus and we got there just in time to catch the 12:00 ferry. Had we missed it, we would have had to wait until 2:00. It was only a 30 minute ride to Isla Holbox. We didn’t really have any info in our lonely planet, but Jo happened to be carrying one on the Yucatan which gave us a couple ideas where to stay. We decided on a place called Posada Los Arcos, which we knew was in the center but didn’t really know how far away that was. Isla Holbox doesn’t have any paved roads and the preferred method to get around there is by using golf carts. Even the taxis are golf carts! We grabbed one to our posada which we thought was kind of cool until the guy took us about 200 meters before we were already there. It was silly really...we probably could have walked faster...although I guess it helped us avoid a couple puddles. We checked in and got lucky enough to pay $10 less than we should have for our room (we didn’t know this until later but our room had AC and we thought it didn’t). It was only about 12:30, which was pretty good...we would have still been hours away if we would have waited for that bus back in Tizimin. Now we had the whole day ahead of us. Our first impressions of Isla Holbox were pretty awesome...all dirt/sand roads as I said before with golf carts zipping around everywhere. We were on one side of the central plaza that had a nice little park on it, including a basketball court (we also saw a court back in Rio Lagartos by the way which I thought was weird since soccer is far more common here). The island was virtually destroyed by hurricane Wilma back in 2004 and it’s very evident as you move around...there are many buildings with walls caved in or that have giant holes. There are others that are slightly newer and also many that are being rebuilt. It’s clear that the town is still recovering from the blow and it was interesting to see that first hand...but also interesting was that life moved on here relatively easily b/c it’s such a simple place. However, this town relies on tourism and the beaches needed to be cleaned and hotels needed to be rebuilt. We noticed several of the nicer cabanas where you could stay on the beach were pretty new. The tourists are just now starting to come back and the island is starting to flourish once again. After a nap we went out to the beach and found Mark and Jo sitting and having a drink at one of the restaurants overlooking the ocean. After Jodi and I explored the coast line for a bit we joined them. There is something about drinking a beer with your feet in the sand while looking out at the ocean...it’s a simple pleasure but an important one to experience. We chatted for awhile there and then they went with Jodi and I as we wanted to seek out some cheap food. We ended up at a little pizza place across the plaza from our posada. Not only was it cheap with good food, but the place had some OUTSTANDING margaritas! We each had a couple as we chatted away in the afternoon sun, very happy with our choice to join forces and come to Isla Holbox. Mark and Jo had already decided they would stay one more day than they had originally planned! I think we also decided around then that we would rent a golf cart the next day and check out the whole island. Later that night, we met up with Mark and Jo for dinner. We ended up going to a pretty nice place. Just a quick aside here...We are having a great time so far but already feel like we are spending way too much money. Mexico is not exactly cheap anyway, and we knew that coming in so we are really trying to make a conscious effort to cut costs as much as possible. I have to admit, I’m very impressed with Jodi so far because she has probably been more adamant about spending less than I have. There is a normal adjustment period that you go through when you start traveling like this...you have to force yourself not to think in dollars because doing that will cause you to spend WAY more than necessary. Even still, it’s not as easy as one would hope to find cheap meals down here...and we’re trying to get better at it. Anyway, since we went to a rather expensive spot that night, Jodi and I ended up splitting a salad that turned out to not only be delicious, but enough food for both of us. I guess that’s a step in the right direction. On our way out of the restaurant I stopped to use the bathroom quickly...and I had a very important revelation. We take a lot of things for granted in the good old USA, but I’ve decided something...the greatest thing about our country isn’t the constitution, or the freedoms we have, or even our powerful economy...it’s our sewer systems!! Seriously...I don’t think I harped on this back in my Brazil journals and I’m sure a few of you have experienced this in latin American countries, but this not being able to flush toilet paper business needs to be remedied. We need to get the world’s sewer systems up to speed so we can do away with the disgusting garbage cans in the bathrooms in all these countries! Also, if this is going to be how it is, I’d like to get a message to everyone out there...please put your toilet paper FACE DOWN in the trash...and as a matter of fact...let’s just get some lids on these garbage cans while we’re at it. By the way...tell the government to stop sending food...these folks need toilet seats down here. I’d say there’s about a 30% chance you’ll find one on any given toilet, and a 5% chance if it’s in a public place. I saw this only a couple times in Brazil and Colombia, but here it seems to be common place. I’m sure I’ll adjust and forget about it as I did before, but it’s early in this trip and it’s driving me nuts. Alright...that’s enough about that...we walked around a little after dinner and just checked out the town. There wasn’t too much happening so we headed back to our posada and crashed. Got up in the morning and met with Mark and Jo to go rent a golf cart around 10. With four of us, it only ended up being US$5 each for two hours, which we figured was plenty...it’s not that big of an island. We had a great drive out to end of island. As we headed out of “town” along the beach the hurricane damage was even more evident...many half destroyed houses/pousadas and many under construction. Once we you get past all the pousadas though, the beach stretches on for about a mile. It was an absolutely beautiful view out there. As you can see there was almost nobody around. 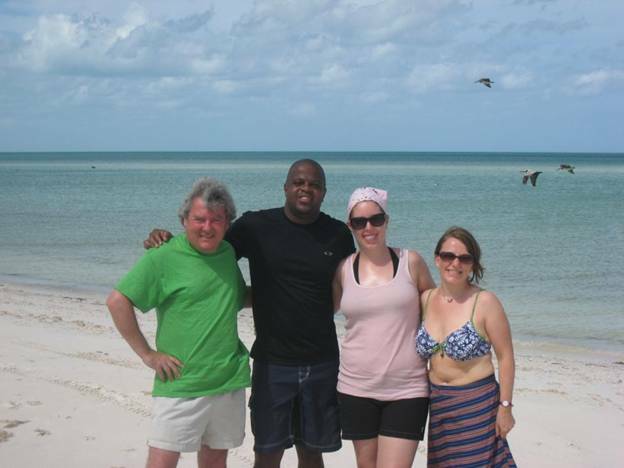 Also interesting about Isla Holbox is that it’s where the Gulf of Mexico meets the Carribean Ocean. You can really see the water getting bluer as you move east on the island. It really was amazing out there...we had a blast and barely saw anybody else...I always find it interesting how many absolutely beautiful places there are to see in this world that nobody really knows about. Sometimes, it takes a little extra effort and time to find them though and that’s part of what this trip is about. The beach became impassable at the far end of the island so we got out for awhile and just enjoyed the serenity of our surroundings. I of course, was playing with around with all these sand crabs we saw out there...it was weird, there were hundreds, if not thousands of them but they were some strange species with only one giant claw. I hadn’t seen that before. I did manage to find a hermit crab or two, which reminded me of the thousands we saw on Isla Iguana last year in Panama. Finally we drove back to the other side of the island. I was at the wheel and was we headed through town we decided to stop for a couple beers. 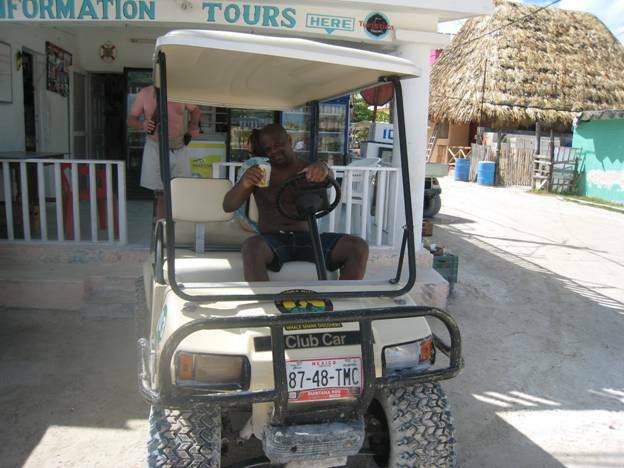 Good times...all rules of drinking and driving get thrown out the window when you’re in Mexico on a golf cart! The other side of the island had a lot fewer beaches with public access and you can’t drive along the shore...but that didn’t stop us from finding a nice little spot. Right about then our 2 hours were up so we had to return the golf cart. Anyone who comes here should definitely team up with a few people and get a golf cart for at least one afternoon...it’s cheap and you’ll get to see some beautiful parts of the island that you might not go to otherwise. When we got back, Jodi and I went in search of a cheap meal once again and we were pleased to find a place to split some delicious fajitas...although we had to split them with about 400 flies. I remember in the north of Brazil there were always a billion flies around whenever I ate and I eventually just became accustom to it and barely would swat at them. I had completely forgotten about that...it was another reminder of how far we are from home. We hung out most of the rest of the afternoon working on journals. Not much else happened the rest of that day. We spent most the evening at the internet place and just walked around a little that night. We actually saw some kids playing basketball out on the court in the plaza. I showed one of them how to dribble for awhile which was fun...I like interacting with the little kids in most places we go. They always see you’re different on the outside but as soon as you start interacting with them, they immediately forget and they just want to play. Perhaps we could all learn something from that. After they left Jodi and I decided to do a little bar hopping around the island. We went to this one bar called Tiki Tiki (it made me think of you Suzanne!) that was pretty cool. We met this French guy there who seemed interesting...he had come to Mexico on vacation and decided “screw it” and just stayed down here. I think he had been here for 2 or 3 months or something. Anyway, he seemed rather sane until he launched into this NASA conspiracy theory that proved quite the opposite. 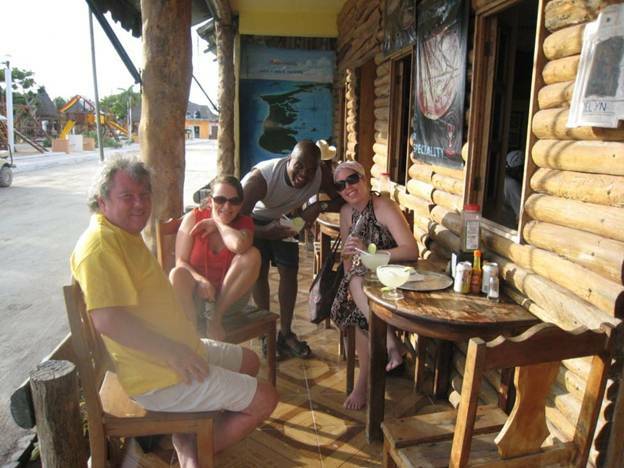 We promptly paid our bill and got out of there and headed for a little bar out on the beach that we had seen earlier. It was a great little place with about 10 or 15 people around. The bartender was a cool guy and we jammed out to some Gypsy Kings (perfect music for sitting on the beach and drinking!) for about an hour. We made one more little stop at what was supposed to be a club but there wasn’t really anybody there. I guess that makes sense for a super tranquilo place like isla Holbox. 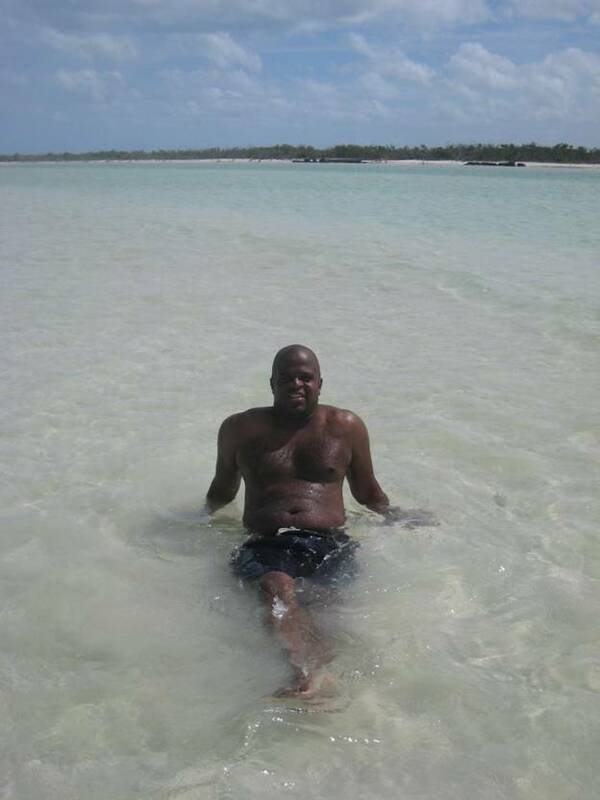 Anyway, it was nice to have had the chance to come to Rio Lagartos and Isla Holbox. These are two great little hidden gems that many people that come to the Yucatan would overlook. It was a great experience that was made even better by getting to do it with Mark and Jo. Ahhhhh the people and places we get to see! As a great Swede once told me, This is life!! It seems crazy to me that it hasn’t even been 2 weeks yet! I can’t even fathom how much more there is out there for us, but I look forward to discovering many more places like these as we travel on.